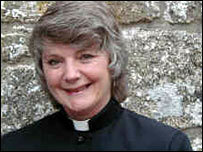 Police are investigating a series of hate letters to a Cornish parish priest and a suspected arson attack at her home. Since July, the Reverend Yvonne Hobson, 56, a curate at Paul Church, near Newlyn has received four letters expressing hatred about women priests. In October church leaders called for a halt to the attacks. Four weeks later a candle left alight in the porch of her home ignited some logs and the fire brigade was called. Ms Hobson, who has been a curate at the church since 2006, is continuing her work as usual, said the Diocese of Truro. A spokesman for the diocese declined to comment further but urged anyone with information to contact the police. A spokesman for the Devon and Cornwall force said the letters and the suspected arson attack were being investigated in parallel. Rural Dean, the Reverend Andrew Wade, said in a statement which was read to the church's congregation in October: "This is a matter of great concern not just to Yvonne, her family and friends but to the whole church here and indeed the diocese."